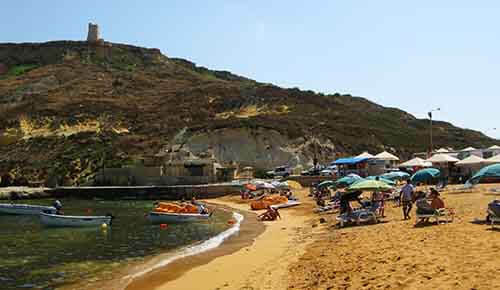 Gnejna bay lies two kilometers down from the village of Mgarr. A total quite rural area with only boat houses built on the side of the bay used by fisherman and boat owners. A really natural environment of a sandy beach surrounded with many clay and limestone slopes. It is dominated with a watch tower at the top of the hill. The sandy beach takes almost all the beach area. On the right the flat rock bed is ideal for those who love this beach but does not like to lay their feet in the sand. It offers a wider choice of bathing situations or a versatile day for those who wish to be away from the crowns. It is not well known with tourists and so you will meet more locals than foreigners. This bay is part of three bays located near each other. Next to it lies Ghajn Tuffieha then Golden Bay. They are all separated with high rock and clay peninsulas with no interconnecting roads. 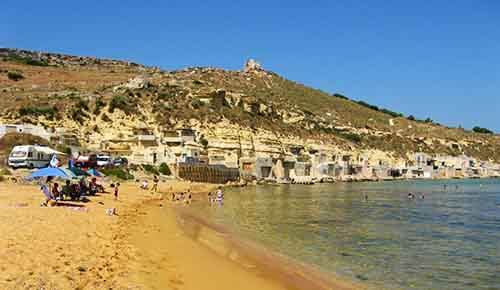 It is only a twenty minute drive from here to arrive to both to Riviera Martinique and Golden Bay via Mgarr. Gnejna is the least visited from the three. Here you find complete tranquility and space to stretch yourself. Different areas on the side of the beach offer splendid areas for swimming. The crystal clear water offers a splendid opportunity for snorkeling. The inner part on the right side is a nudist’s hideaway although this is illegal in Malta. The village lies in the country side, being the most isolated village 5 kilometers away from Mosta. The parish church is very prominent lying in the centre of the village with a large square in front. The population is very much engaged in agriculture with very rich farmland. They are well known for the growing of strawberries, watermelons and vine yards. It is located just before proceeding to Gnejna bay. The bay is kept clean all the time and the water is crystal clean. A mobile vans provides beach snacks, drinks, sunbeds and umbrellas. At the village of Mgarr, at the village centre around the parish church, there are various restaurants and bars. The restaurants serves a Maltese speciality of rabbit. - It is very easy if you have a self drive car. Follow the signs up to the village of Mgarr. From behind the main village church there is the road leading to Gnejna bay. - There is ample parking beside the sandy beach. During peak summer the parking will be full but you can part along the main road. - No specific warnings except when the sea is rough that one should be careful. This is mostly during th winter time and does not effect much of the swimming period. - You can easily rent sunbeds and deckchairs from mobile vans situated beside the beach entry point. - Lippia watch tower was built in 1637 by the Knights of St. John by the then Grand Master Juan de Lascaris Castellar. The towers were used as an advance warning system. - Two of the oldest prehistoric sites which are known as Ta’ Hagret and Skorba are close to Mgarr village. - In this locality does not offer any hotels or accommodation. 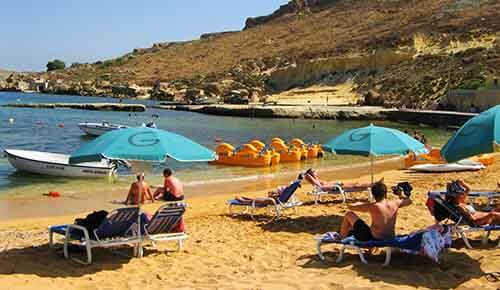 - The closest hotel is at Golden bay, the Radisson Blu Resort & Spa, Malta Golden Sands. 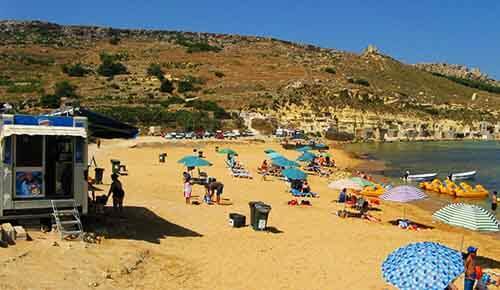 Gnejna Malta beach is the place where you can enjoy a quiet swim.